McDonald’s is to tour agricultural events around Britain with a roadshow that uses virtual reality to bring people closer to the fast food chain’s supplier farms. 'Follow our Foodsteps' will pioneer the latest in virtual reality technology and 3600 video to tell its UK food story through the eyes of the people who grow, produce and prepare food for its UK menu. Follow our Foodsteps forms part of Farm Forward, McDonald’s UK’s long-term programme to address the challenges facing the sector. The campaign launches as industry statistics show the UK food and farming industries are hungry for fresh talent across a vast array of areas including farming, horticulture, engineering and food development. According to the Food and Drink Federation, there is a need to attract 109,000 new recruits into the food industry by 2022 as the UK population is projected to rise by 4.4 million in the next decade. McDonald’s UK brought together a collective of tech developers, young farmers and food experts, challenging them to use technology to give the public a real-life glimpse of how the food on its menu is made and where it comes from. The resulting experience, which embarks on a journey across the UK from today, will transport consumers behind the scenes on some of McDonald’s UK’s flagship farms, factories and restaurants – all without having to physically be there. • Three quarters of people (74%) want to know more about where their food comes from. • One in five people can’t explain any process behind food production. • Two in five people (41%) have never set foot on a working farm. • 83% of people have never been given careers advice about the food and farming sectors. • 60% of people have never considered a career in food and farming. Starting today, the Follow our Foodsteps experience will begin a 2,000 mile journey across the UK. The experience traces the three key stages of food production from provenance (farmers and farming), to production (suppliers and process), right through to preparation and cooking (restaurants and crew). All of the farmers, food developers and experts featured in the immersive experiences form part of McDonald’s own leading UK supply chain. An Oculus VR headset will invite users to test their skill behind the wheel of a tractor during a potato harvest as they are judged on speed, accuracy and the quality of the successfully harvested crop. This series of immersive videos will transport visitors to an organic dairy farm in South West England and a free-range egg producer in Cumbria, before giving them the chance to look around one of the two dedicated production facilities that make McDonald’s 100% British and Irish beef patties. People will step into an immersive cinema and follow McDonald’s crew as they take an order and prepare food in a busy restaurant kitchen. This experience includes a food and farming skills challenge, developed by McDonald’s in collaboration with leading agricultural university Harper Adams, the Agricultural and Horticultural Development Board and McCain Foods UK. Connor McVeigh, Director of Supply Chain, McDonald’s UK, said: "As a nation, we have never been more food-focussed. "The eating out market is growing but this passion for food is masking a lack of understanding around how food is produced and the vital role our farming and food industries play in growing, sourcing and producing quality ingredients. "As one of the biggest customers of British and Irish farming, we want to lift the lid on the passion and skills that exist at every stage of the process, from farm to front-counter. "Over the last decade we have invited people behind the scenes of our own supply chain on a number of occasions but we wanted to take this even further. 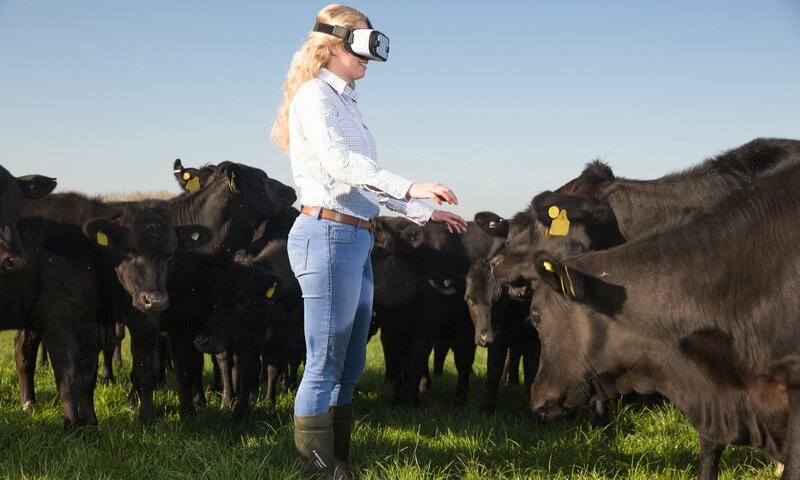 "By bringing together tech developers with farmers and food experts, we have created an immersive virtual reality experience that will allow people to follow in the footsteps of farmers, suppliers and our crew, bringing the best of UK food production from the countryside to communities across the UK. Environment Secretary, Elizabeth Truss said: "As a nation we are now far more plugged into where our food comes from. "Projects like this that link field to fork, or in this case fingers, not only supports our farmers but educates our children too. "With 3.8 million people employed in the food chain it is vital for our economic future that we make British food and farming all it can be. "By embracing the latest technology we will foster the next generation of entrepreneurs."